Since I saw Charlotte Casiraghi at the Gucci Summer 2014 I’ve wondered about her glorious shade of crimson. Today over at Vogue there is an interview with her and she tells us what shade she was wearing and ladies, I have a feeling it’s going to be worth it. Right now, I think it’s only available through Gucci.com, and it’s $39, which for Gucci is reasonable. P.S There is a complete makeup collection available and I heard the packaging and quality was amazing. 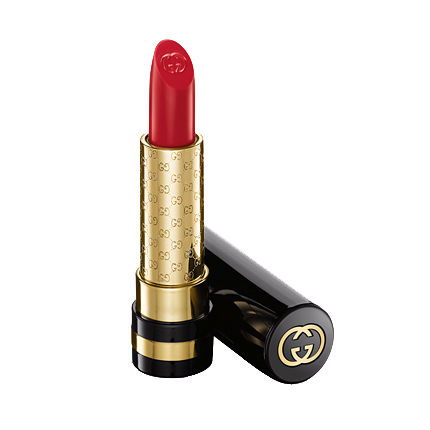 Posted in Beauty, Lifestyle	Charlotte CasiraghiGucci’s Iconic Red lipstick. I’m so excited, yet frightened, to try this line… The shade in the video on the site is TO DIE FOR. Lucky for me I’m just interested in the lipstick, if it looks great on me it’s a keeper, otherwise I’m safe. Let me know what you think if you see it before I do.